This dry, white, non-toxic modeling material produces objects that are very lightweight, strong and durable. 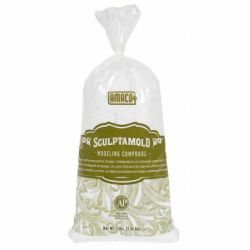 Sculptamold® is a dry, white, non-toxic compound that combines the best features of clay, plaster, and papier mache, does not shrink, and is durable for dioramas, 3-D sculptures, model railroad scenery and stage scenery. 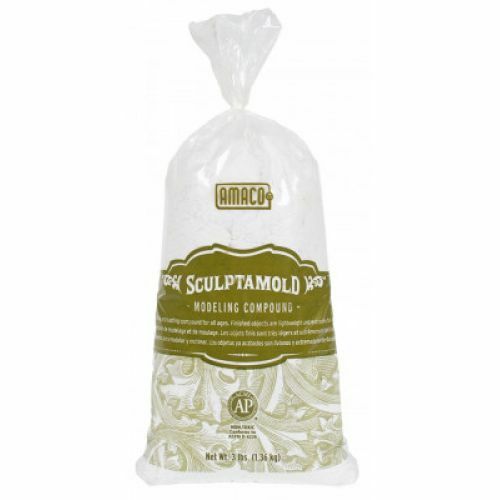 After shaking closed bag to thoroughly blend contents, add water to Sculptamold® as directed on bag and begin modeling. Sculptamold® sets in 30 minutes, so prepare only as much as can be used in a half hour of modeling time. Sculptamold® clings to almost all clean surfaces and can be applied to an armature or any core without fear of cracking. Continue to add Sculptamold® by shaping and modeling layers over the armature. Even though it hardens in half an hour, you can continue to work with it as long as you have to, by adding layers of freshly mixed Sculptamold®.